I can’t stand before you this morning without at least acknowledging the day. Yes, it’s Easter. But it’s also April Fool’s Day. This day doesn’t fall on Easter often. The last time was the year before I was born. The next time, I’ll be retired. Don’t worry. I don’t have any jokes or tricks to play on you, but it does seem to me that God played the perfect joke on the Jesus’ executioners. I’m reminded of a short collections of lectures by Frederick Buechner titled, Telling the Truth: The Gospel as Tragedy, Comedy & Fairy Tale. Some might take offense at the title, but it makes sense. As tragedy, the gospel begins with the crucifixion. As comedy, the reversal from death to life fits the classic understanding. And as fairy tale, we have the extraordinary things that happen to Jesus and his followers down to this day. 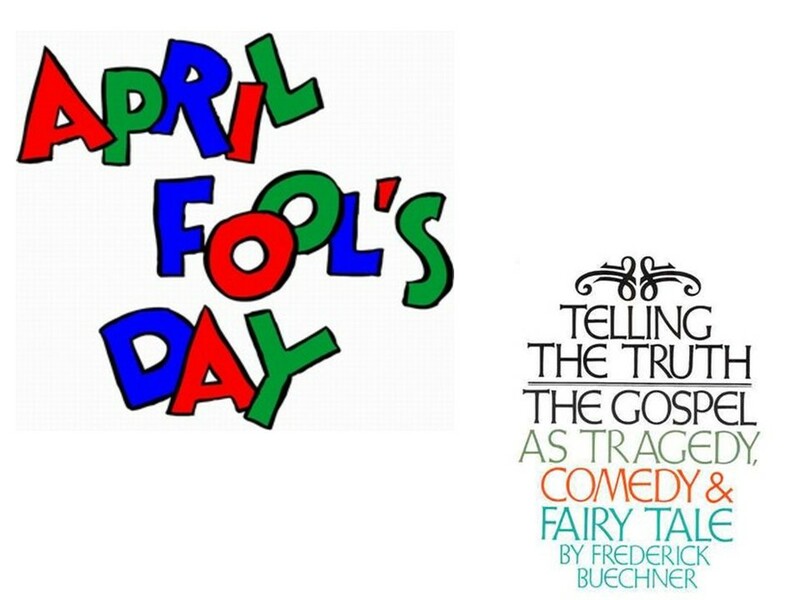 Happy April Fool’s and may we continue to be surprised by God. When I was a pastor in Southern Utah, there were two families I knew I would not see in church on Easter. 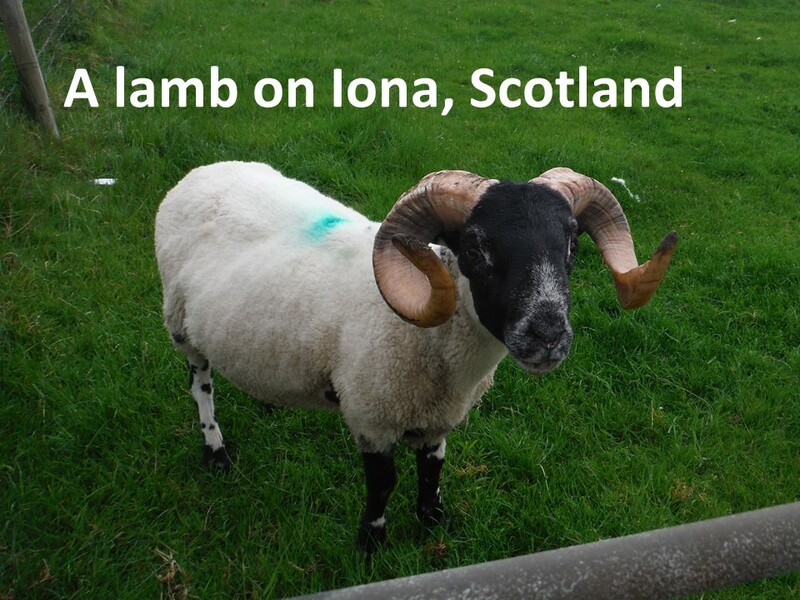 Both were involved in the sheep business and when you have 1500 pregnant ewes, all delivering during a three or four week period in early spring, they were busy. They lived during these weeks at the birthing sheds. They needed to be there in order to help the animals. It was quite an operation to see so much new life as these lambs tried out their legs and nursed at their mom’s bellies. Lambs and Easter seem to go together. You can find chocolate lambs. Some people roast lamb for Easter dinner. During this past season of Lent, we’ve been exploring throughout Scripture the theme of “the Lamb of God.” It’s interesting how, in scripture, God’s people are equated with lambs such as in the 23rd Psalm and in Jesus’ and Peter’s conversation at the end of John’s gospel. Jesus tells Peter to feed his lambs and sheep. But it’s not only us who are seen metaphorically as lambs. As we’ve seen over the past six weeks, Jesus is also seen as taking on the role of a lamb, the sacrificial Passover lamb, providing life for God’s chosen people. 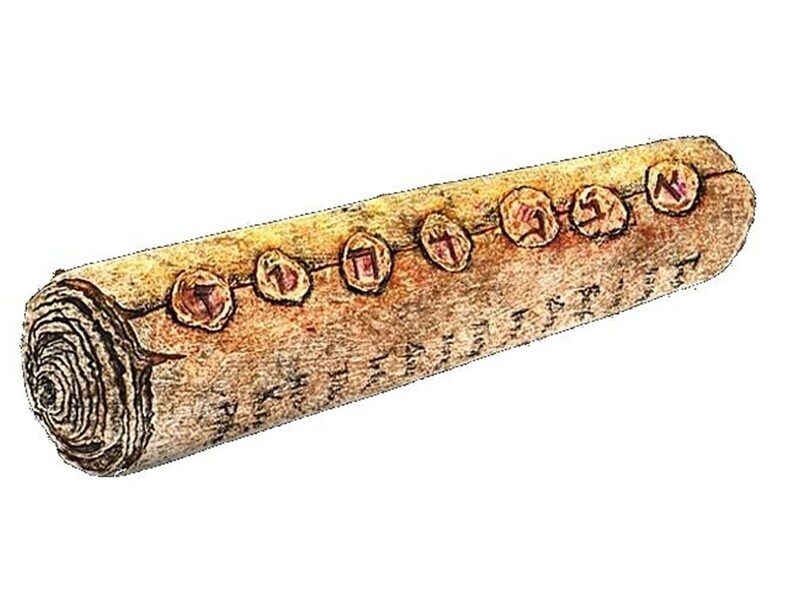 The scroll is the focus of the fifth chapter. Sealed with seven seals, it contains God’s plan for the future. John discovers in his vision, which fills the sky, that there’s no one worthy enough to open it. John cries. Without opening the scroll (without moving into God’s future) the powers of evil that have thrown themselves against the godly and have persecuted the church will prevail. John has this vision at a time the continued existence of the church is in question. Persecution threatens. John, himself, is exiled to a deserted rocky island because of his faith in Jesus Christ. He’s lucky. He could have been killed. 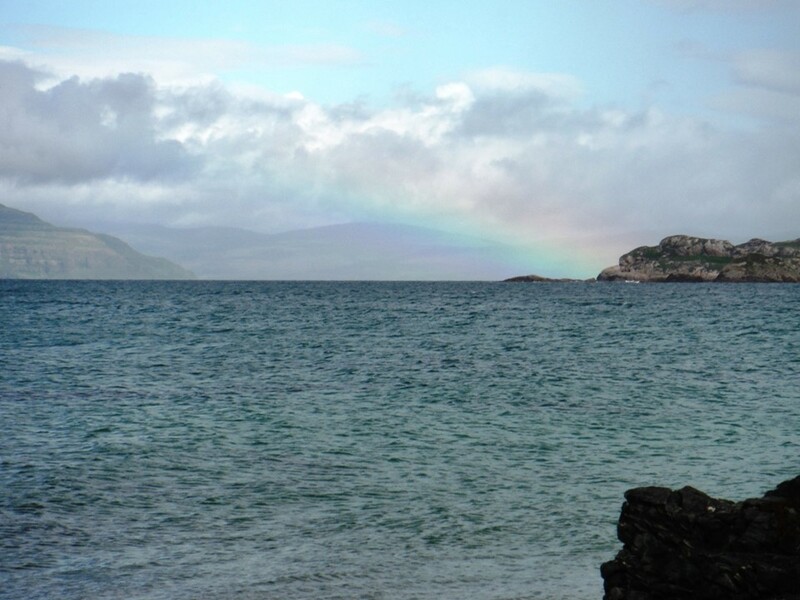 But there on those rocky shores with the sound of lapping waves, John has a vison that fills the sky. It’s a vision that reminds him and us that God will be victorious. It might not have looked that way when John was dumped out on this island. It didn’t look that way at daybreak on the first Easter when the women make their way to the tomb to prepare Jesus’ body for the grave. It may not look that way for some of us who are troubled. But God has a way of surprising us! One of the elders standing near to God’s throne points out that there is, after all, one who can open the scroll. Time in Revelation is not neat and chronological as we like. At the point there was no one worthy probably refers to the time before Jesus’ death. Seeing the condition of humanity, God decides to rescue the world by entering the human sphere in the life of Jesus Christ. Now, moving back to after the resurrection, there is one person worthy. Now notice the difference between the fifth and sixth verses. Do you catch the humor? 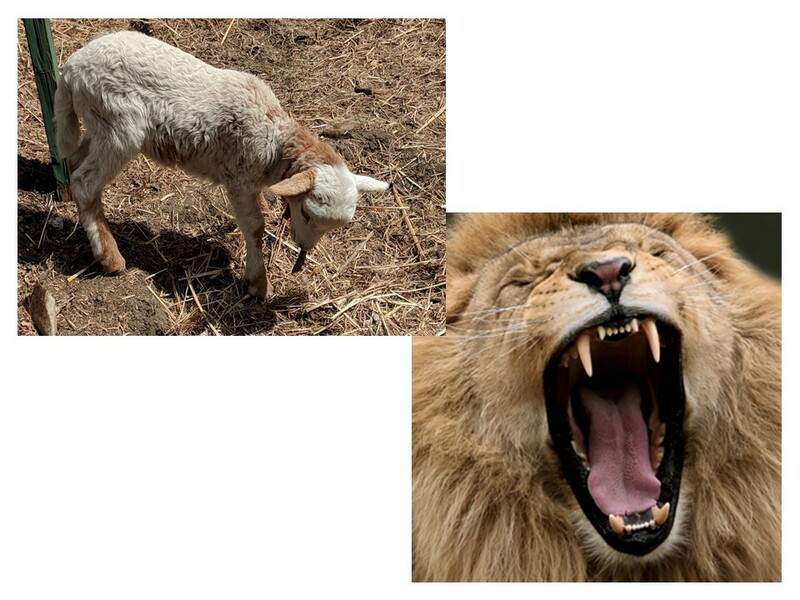 In the fifth verse, John is told to look at the lion, but in the sixth he sees a lamb. He expects to see a raging lion who has conquered evil by brute force. Instead, we see a lamb that has been sacrificed. April Fools! God didn’t choose to conquered evil by physical strength; rather, God chose to submit to evil through Jesus’ death on the cross. This sacrificial act shows the limitation of evil’s power. Jesus’ resurrection conquers death and demonstrates evil impotence. “Victory through sacrifice” is the central theme of the New Testament revelation. It’s important for us to remember that when John witnesses this vision, the church is in mortal danger. John’s vision isn’t to go and tell his fellow Christians that everything is alright. They knew good and well that things are grim and if something doesn’t happen they will all be exterminated. 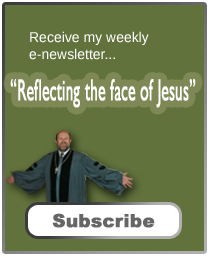 What John’s vision does for his readers is to assure them that God is in control. In the end God, through Jesus Christ, will reign triumphantly over evil and death and destruction. 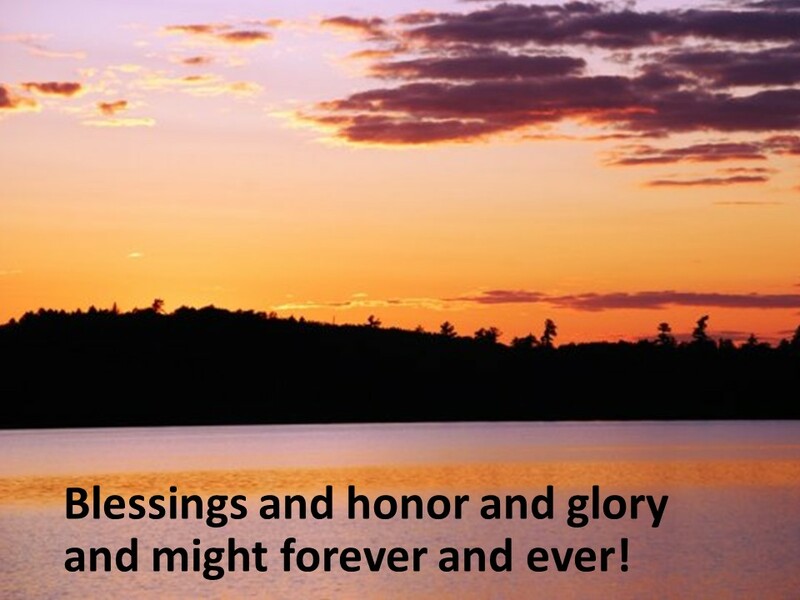 There may be suffering and persecution here on earth, but in heaven, they’re already celebrating victory won over evil when Jesus rose from the grave. 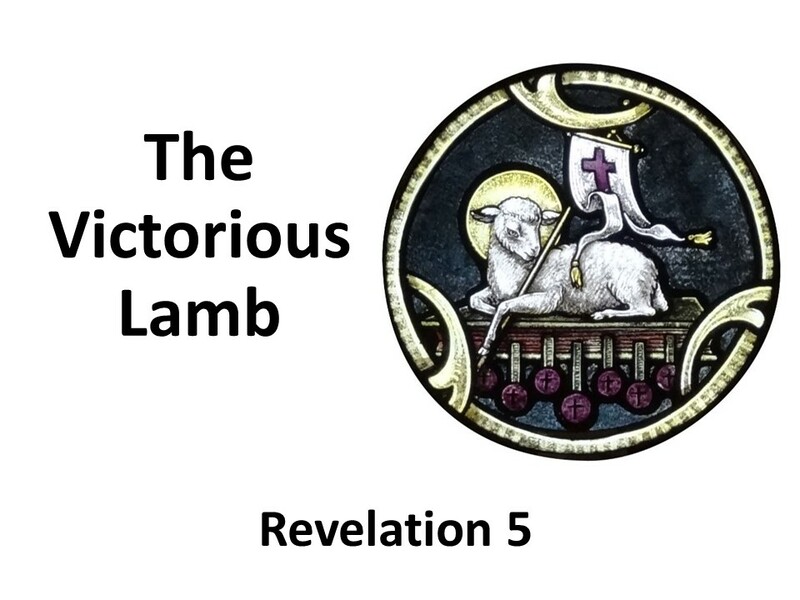 The lamb envisioned in Revelation 5 is a little weird. Seven horns, seven eyes (and seven seals). This isn’t to be taken a literally as to how the resurrected Jesus looked. Seven in the Biblical world represents perfection and holiness, attributes assigned to Jesus. So Jesus Christ, the lamb that has been sacrificed, takes the scroll. 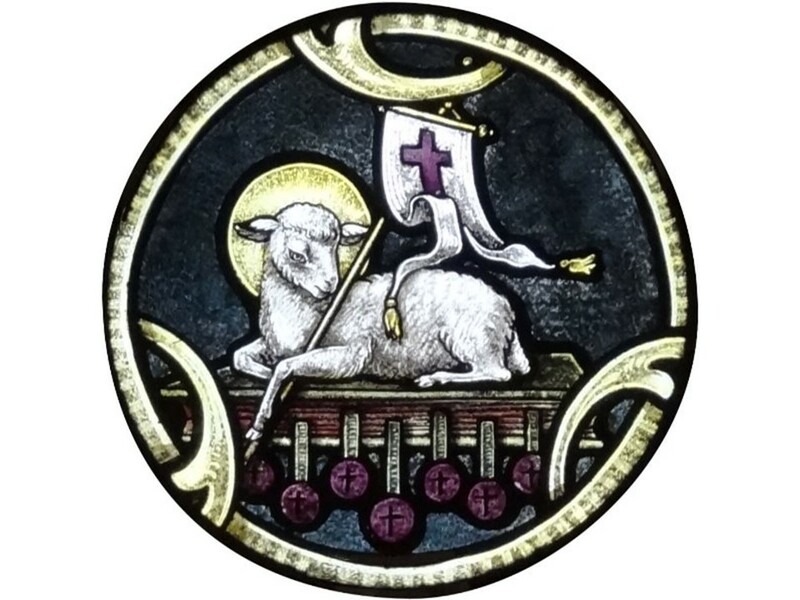 You can one artist rendition of this on the cover of our bulletin, where the lamb sits on a book with seven seals (in this photo, he’s lost the seven horns and eyes and the scroll has updated to a book). God’s plan is moving forward. Having defeated death on the cross, he sets out to free the universe of all evil. This causes song upon songs to rise throughout heaven. Christ, the Lamb of God, is praised. He inaugurates a new era. Think about this for a minute… Christ has in his possession the scroll containing the future. But we are only in the fifth chapter of the book of Revelation. There are 17 more chapters. There are stories of galactic battles and martyrs to come; at this point Christ who has mortally defeated evil has not yet fully conquered it. Evil is still present in the world. We know that. We’ve seen it in Parkland and in dozens of other shootings. We’ve seen it in Syria. We see it in our community, though thankfully the number of shootings are not as high as they were a few years ago. We also see evil in many places in the world where the church is still under threat. This past week a Christian man was beaten to death in Pakistan. Two weeks ago, Boko Haram, the horrible terrorist group in Nigeria returned all the girls kidnapped except the one who refused to deny her Christian faith. We don’t understand why God allows such evil to happen in the world. The question of why, if God is all-powerful, God allows such evil, has been around for thousands of years. The rabbis debated this question in Jesus’ day. The book of Job was written in an attempt to help us wrestle with this problem, but we’re left with what many consider an unsatisfactory answer. 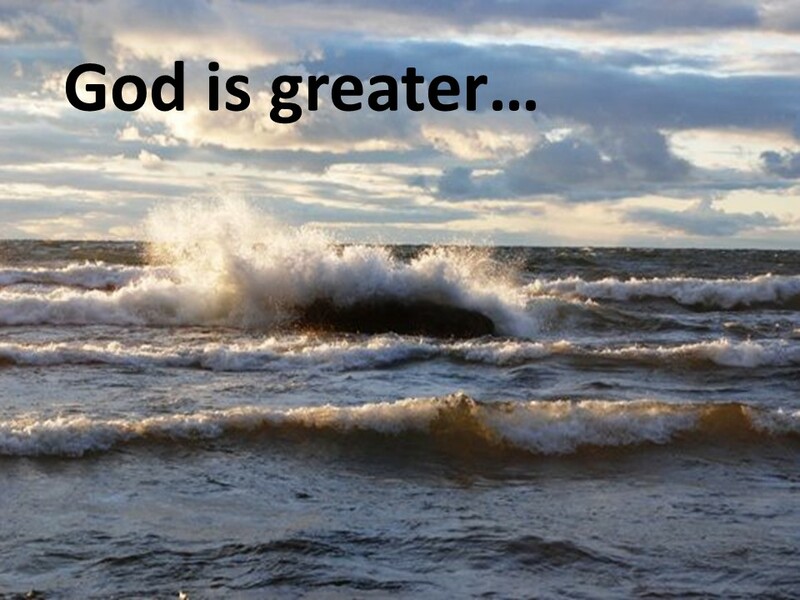 In Job’s search, he encounters God, and comes away only with a sense that God is greater. It’s impossible to fully understand the Creator. But we are to sing, for we know the future. 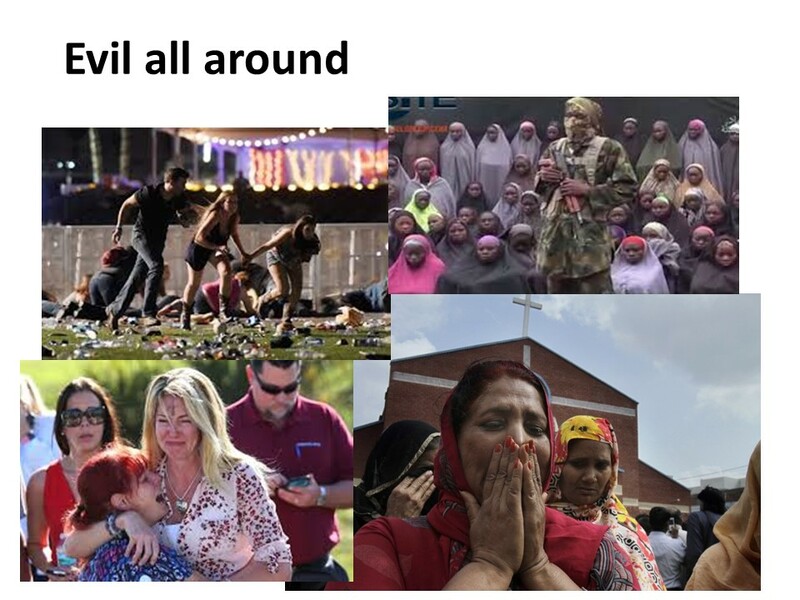 We know what is happening and will happen. So we join the multitude singing praises and trusting in the goodness of a God who raised Jesus from the dead. Now, was all of creation singing praises to God during John’s day? Of course not. As I said earlier, time in this chapter is somewhat transitory—moving quickly from before Christ’s victory over death to the complete fulfillment of God’s plan for creation. A fulfillment for which we are long. But we know the ending. We know who’s in charge. Friends, like those in this vision, be filled with the songs of Easter. May they give us hope. Death is not the last word. Evil will not have the last word. Jesus rose from the grave; there’s a new world coming. Rejoice! Amen. Frederick Buechner, Telling the Truth: The Gospel as Tragedy, Comedy & Fairy Tale (San Francisco: HarpersCollins, 1977), 7. Robert L. Reymond, The Lamb of God: The Bible’s Unfolding Revelation of Sacrifice (Mentor, 2006), 103. 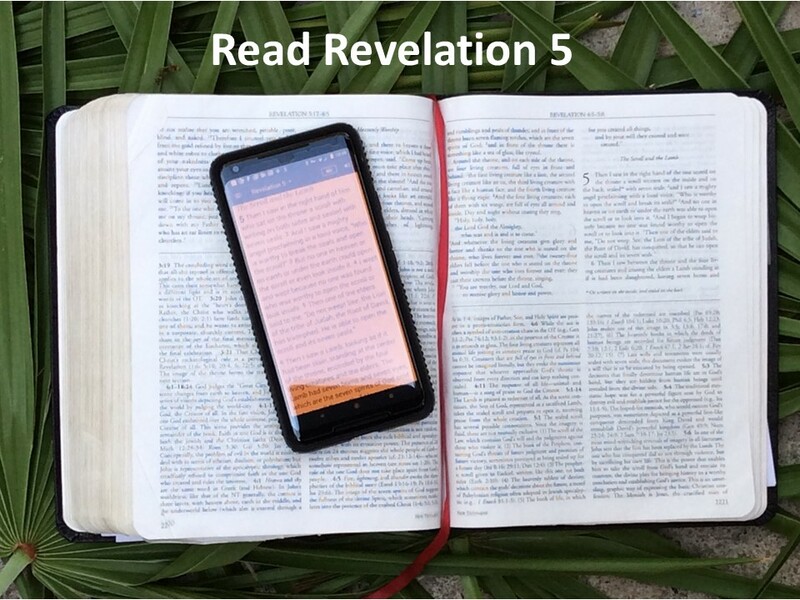 Robert H. Mounce, The Book of Revelation, revised, (Grand Rapids: MI: Eerdmans, 1997), 132.